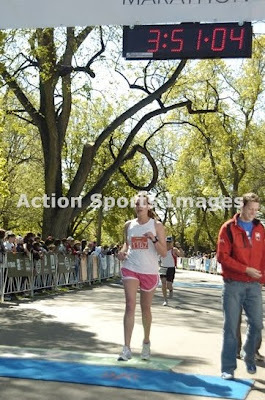 than me that may have gotten me the only sub-4 marathon finish I'll ever have. 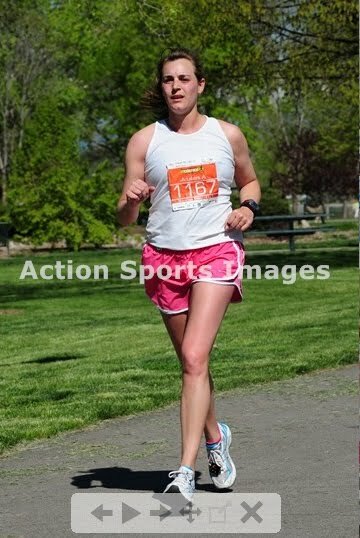 Well since I ran the Colorado Marathon just a week before this race, I wisely realized that it probably wouldn't be my smartest move to try and run the Colfax Half again this year. Though I really enjoyed it last year and kind of wanted to try and beat my 2009 time, over my last several months of "running smarter," I did actually learn something. I learned to keep the big picture in mind, and not sacrifice my lifelong running "career" for one measly race. So, I didn't register for the Colfax Half. 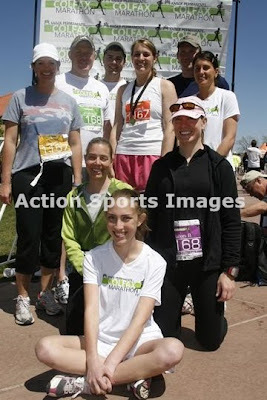 However, if you paid attention to the title of this post, you see that instead, I got myself1 onto a relay team. I ran the anchor leg of the relay, which in my opinion was the best part of the race, for several reasons. One: the race started at 6am. However, I only had to show up for the final 5.3 miles...which meant sleeping in and rolling into my relay exchange point about 8:30. Lovely! Two: My leg was through the lovely LoDo, then past all three of my former work office buildings, along a short piece of Colfax, then through City Park. Splendid! Three: I got spectators and finish line goodness. Delightful! Four: Plenty of paparazzi race pics due to photos positioned near the start/finish of the race. Fabulous! 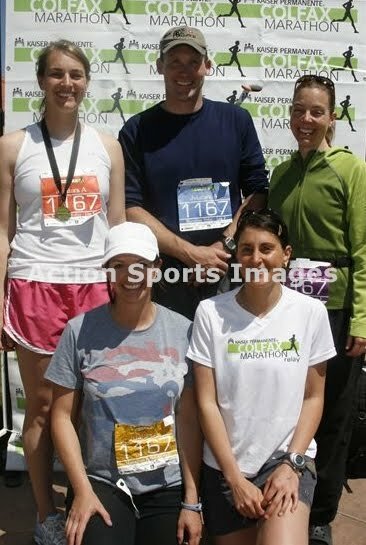 Five: I got to encourage all those full marathon runners around me in those last 5 miles, when I knew they were feeling it. My team finished in 3:51:06, so those were my fellow middle of the pack peeps I was boosting. Just one short week after my own full marathon, I knew first-hand how helpful that support can be. Fulfilling! Rewarding! Memorable! One of the paparazzi shots where I don't look tired. There were very few of those. 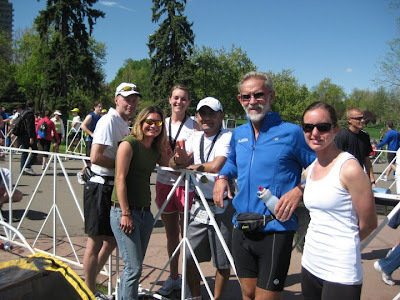 Seven: I spotted my HRRC running buddies, who were there to help support fellow HRRC first-time marathoner Massud, just as I came into the park for the last couple of miles. Marvelous! Excellent recovery run and a medal to boot! And yes, I totally got your "felly" reference. HA!